I don’t expect anyone will want to listen to it, but for those curious what my days are like, it’s here. 27:45 – Mom tries to write down the date and the day of the week. 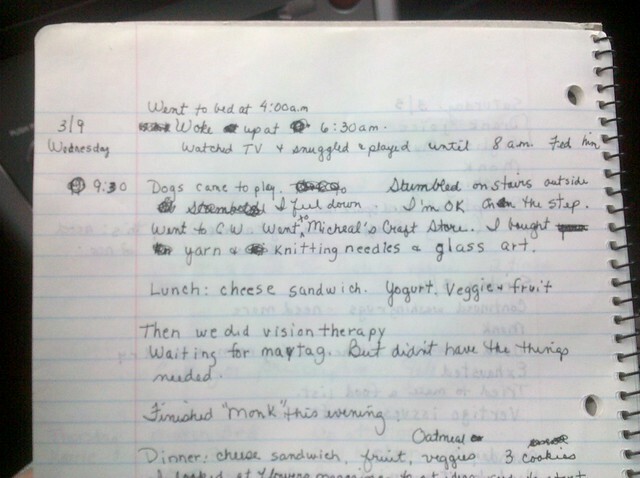 28:40 – Mom tries to remember what she was doing when we started trying to write down the date and day of the week. She hasn’t figured it out yet. 29:35 – She figures out it’s March and guesses the date. Then immediately forgets. 30:37 – She figures out it’s March 9th and starts trying to work on the day of the week. 31:20 – We finally have the date and the day of the week… “no, that’s not right.” But it is. 32:10 – Five minutes after we began, the date and day of the week are written into her daily log. Next, we try to figure out how to write down what time she fell asleep and what time she woke up. This is not as easy as it sounds. 33:40 – We reestablish it is Wednesday before writing down when she went to bed and woke up. 35:50 – She successfully writes down what time she went to bed. 36:20 – She gets what time she woke up pretty quickly thereafter. 39:40 – She writes down what time I arrived and that she stumbled down her front steps, but it takes a few tries. Despite the fact she fell down the stairs, the salient point she remembers is that my dogs arrived. 40:55 – She gets hung up on where my dogs were fed, and that the word “fed” makes her think of FedEx. 41:49 – She starts writing down “took to” and gets looped. 42:50 – She tries to figure out how to write down a sentence about falling on the cement steps. 43:38 – We try to spell “stumbled.” This will go on for considerable time. 46:05 – We have the fall documented at last. 47:49 – She tries to write “knitting needles.” I very nearly lose it during this process. 51:00 – She gets “knitting needles” written down, and we both survive. 51:25 – She tries to write down the glass art project we bought. 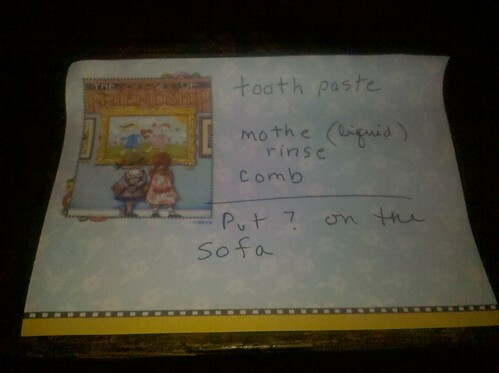 I hide the package so she has to remember how to spell it. 56:50 – After twenty minutes, she finishes writing what amounts to about 10 items. This is her world, people. And now, mine. This is a woman with a PhD. Needless to say, we both hope she recovers. Oh hon, how … there is no word for this.